Come check out a new kind of Blackjack! Open daily Monday-Saturday from noon-midnight and Sundays 4 p.m.-midnight. 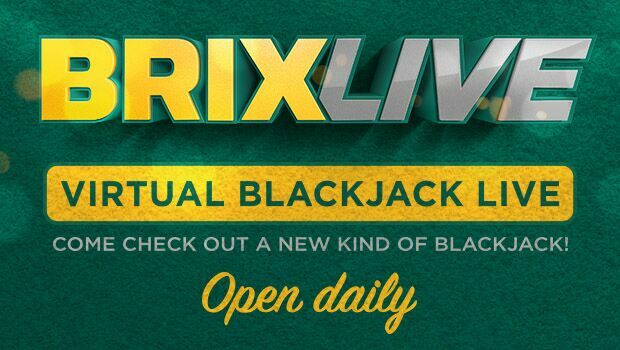 BrixLive (Blackjack) is a table game which allows Patrons to wager via a touchscreen tablet directly against the live streaming Dealer (player pool), by playing their hand(s) against the Dealer (player pool). A Patron’s hand consists of two original cards with the option to stand or draw additional cards in an attempt to improve its value. The Dealer’s (player’s pool) hand also begins with two original cards, but is forced to draw until a total value of seventeen or higher is reached. The hand that is closest to twenty-one without going over wins. If any hand draws to a value that exceeds twenty-one, that hand is said to be “too many” and is an automatic loser. Winning hands are paid even money. A Blackjack (natural 21) pays 3 to 2, Insurance pays 2 to 1 and all other winning wagers pay 1 to 1. Double down is allowed on the first two cards. The double down wager amount must be equal to or less than the amount of the player’s original wager. Only one additional card will be dealt when a player doubles down. Players may double down on blackjack. Pairs may be split one time for a total of two hands. Players may Double Down after split (except on split Aces). Split Aces will receive only one card on each Ace. Wagers may not be altered after the round of play has begun. Each player is responsible for knowing the total of their hand. Players may play up to two hands. Side betting between and against players is strictly prohibited. Participation in the game is gained via the gaming terminals. Players will place a wager, along with an ante to enter the game. The manner in which BrixLive will be dealt is at the discretion of the Chickasaw Nation. Each player will have the right to make an insurance wager up to half of their original wager whenever the dealer’s up card is an Ace. All winning Insurance wagers will be paid at odds of 2 to 1, the original wager will be lost if the insurance wager is won. An even money option, when player has blackjack and dealer has an Ace, is available when the dealer offers Insurance. Even money is paid at odds of 1 to 1. All decks of cards used in play will be a standard “52” card deck (barcoded). Dealers stands on all “17’s”. BrixLive may be played with six or eight decks. Any card from 2 to 10 will have its face value. Any Jack, Queen or King will have a value of 10. An Ace may have a designated value of either 1 or 11, depending on the count of the player or the dealer. If the value of the Ace would give a player or the dealer a score in excess of 21, it will have a value of 1. A player may elect to draw additional cards whenever his/her hand total is 21 or less. All Title 31 and Currency Transaction Reporting (CTRC) requirements will follow the general guidelines and requirements set forth from The Chickasaw Nation Department of Commerce. All game irregularities/disputes will be handled by management and at the discretion of the Chickasaw Nation. In the case a dispute cannot be resolved by facility management, the player may invoke their right that exists under law to request that the Chickasaw Nation Office of the Gaming Commissioner conduct an investigation into their prize claim. Management will immediately notify the Chickasaw Nation Office of the Gaming Commissioner.